The 13e Biennale de Lyon (Lyon Biennial) has begun on 10th September last week. This year, it begins a new trilogy under the theme of “modern”; a theme that Thierry Raspail, artistic director of the Biennial, gave to Ralph Rugoff, guest curator for the 2015 edition. 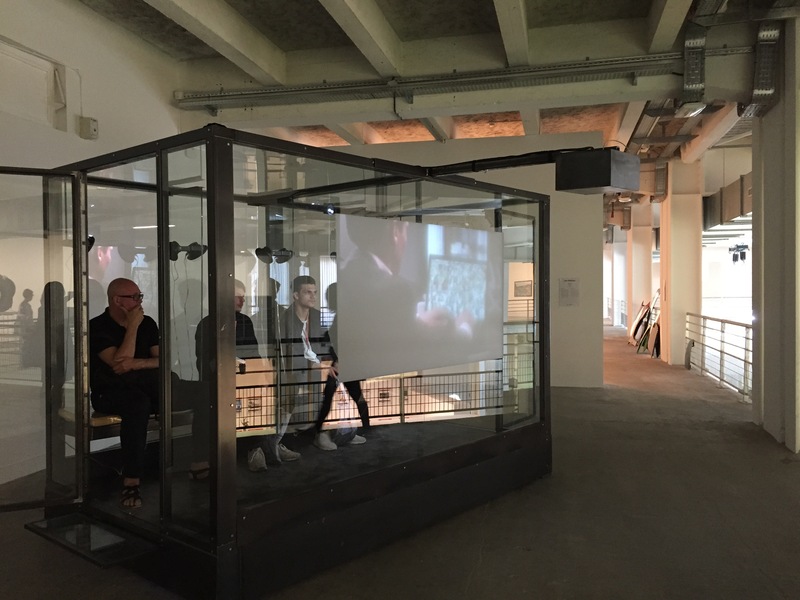 60 artists from 28 countries have participated in the biennial and their works are mainly located in 3 venues namely MAC Lyon (Museum of Contemporary Art), La Sucrière, the Musée des Confluences. The artists offer their personal vision of the contemporary world and invite the audiences to go into this contemporary world through their works. The visual and auditory effects of the installations mingle together to yield a novel experience for the audiences. The work Taut Eye Tau created by Alex Da Corte is a study of the color yellow undertaken through the exclusive use of its “opposite color” blue. It consists of a decor that recalls both the Stanley Kubrick-style science-fiction and the subtle processes of Sol LeWitt-style abstraction. Taut Eye Tau is a total environment: it includes pieces of furniture, a carpet, sand, neon tubes and a video projection whose soundtrack is also based on the color blue. This single color of blue brings to mind the seas and the sky, absence and desire, the horizon and the immaterial. It implies to us that what we see as real is instead usually not too complete. A strong visual implication exists. At the other side, the Glass Troll Cave (glass cabinet and flat screen) and Erysichthon (HD video) created by Jon Rafman provide a combined visual and auditory experience. The digital technology and the new media hold the world at a distance. In his installations, photographs and videos, Jon Rafman expresses a sense of melancholy and irony to our social tradition and virtual communities. We cannot go round this point without mentioning the work of Céleste Boursier-Mougenot, aura, 2015. In his work aura, the drum head is struck by cherry stones, triggered by the electromagnetic aura given off by each owner of a cell phone who visits the Sucrière. The sound produced by the fall of the cherry stones is thus random and variable. This work gives a new interpretation to his previous work in 2013, in which water falls to strike a drum kit. Perhaps what makes this year’s biennial interesting to the audiences is the room for their imagination and participation. Pull over time created by Michel Blazy is a combination of technological objects like computers or cell phones, and manufactured objects like a branded sports shoe. The artist grows things in them, as if in a vegetable patch. Colored water runs down the walls all the time. All the visual effects produced by the decay of these objects are an integral part of the work, and this goes against the belief that the finished products are impervious and resistant to change. Nina Canell’s installation Mid-Sentence gives concrete expression to the lightness and intangibility of the everyday life. Mid-Sentence consists of subterranean cable-cuts and compressed fiber-optic “sheaths” like conductors and transporters. Arranged like relics, these cables evoke both the idea of dissolved geography and corrupted representations of language and body. Lai Chih-Sheng’s work Border provides a vivid example of conceptual of the space. 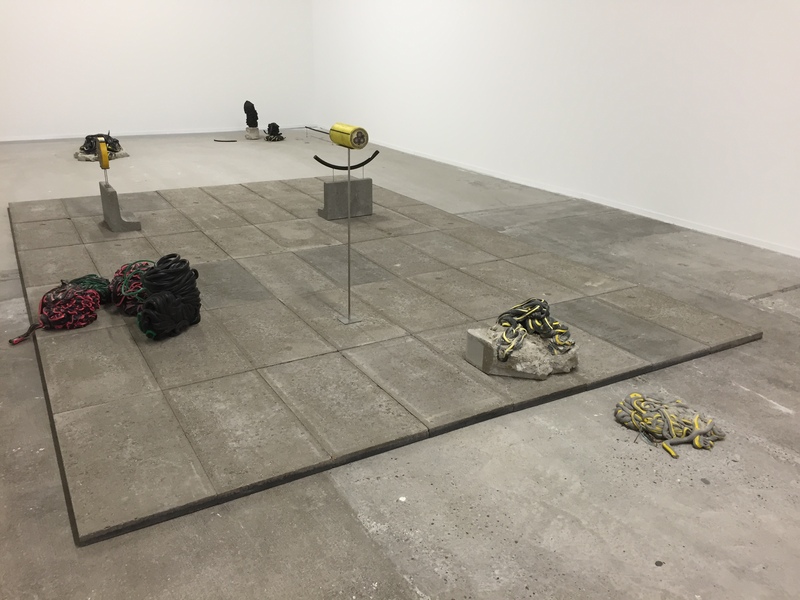 The artist displays waste materials from the construction on the floor, with a border/ platform suspended over a vast space. The artist places the importance on the audience’s experience. Visitors are invited to walk on the border. They would find themselves on the visual border between the physical reality of the space where the work of art is deployed. One may ask in what sense these works are related to the theme “The Modern Life”? Perhaps the first thing to put in place about “modern life” is the “problems” nowadays, in the context of “everyday life” scenarios throughout different regions in the world. “La vie moderne” includes works that take on some of the most perplexing and troubling issues of our moment — from the growing inequality of wealth in society and consumer culture to the questions around immigration, post-colonial relations and our changing relationship to the world around us and our relationship with each other. The artists explore the contradictory and contingent nature of the modern, both on an aesthetic and philosophical level as well as in the area of social formations, subjectivity and technology. They express their ways of seeing and thinking about the world around us. Like in the work of Guan Xiao, he has created a video installation made of ten screens and surrounded by three sculptures. The particular materials used come from various different periods and cultures, bringing together a time where the future and the past will overlap. The video installation is a collage of found images from the internet collected by the artist over the course of several years. The artist has staged her own vision of the world – one with overexposure to images that surround us. Another point worth to notice is the relationship between the past, present and future. “Modern” is shrouded in uncertainty, as is our relationship between past and present. To describe something as “modern” today imbues it with an aura of uncertainty — it suggests something haunted by various “modern” episodes in history while at the same time retaining something of its traditional sense. We cannot mark a significant break with the past. We cannot escape from history. Instead, our only choice is to work through and re-direct its legacies. We would rather interpret modernity as an evolving process, which embrace the past and elongate to the future. Emmanuelle Lainé brings to us similar intonation in her work « Il parait que le fond de l’être est en train de changer? ». The artist used elements that she had made beforehand (flat screens molded in silicone) and others that she “arranged” on the spot (pieces of furniture, plants, packing cases…etc.) to set up a vast treasure hunt. She kept adjusting and correcting the scene until she finally made a wide-view photograph of her creative process. After the photograph was fixed to the wall, she then destructed and modified the scene. Objects now become images, which then become objects again. These narratives through time and dimensions reflect also a shuffle between the past and present – an echo with the underlying interpretation of modernity. Emmanuelle Lainé, Il parait que le fond de l’être est en train de changer? Along with this sense, we may believe perhaps the most truly contemporary art doesn’t present us with endless novelty, but with new ways of working through history. The 13e Biennale de Lyon will last from 10th september 2015 to 3rd January 2016.